We’d love your help. 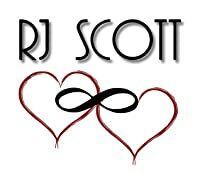 Let us know what’s wrong with this preview of The Fire Trilogy by R.J. Scott. Kian knows Regan is the perfect man to fight alongside him, but Regan trusts no one. It isn’t until they are facing death and a terrible evil that Regan finally realizes he can trust another; his fated partner, Kian. Ceithin teaches Darach that you shouldn’t always believe in fairy tales. Now they have two choices; do they run, or do they make their stand together? To ask other readers questions about The Fire Trilogy, please sign up. I used to think that I didn’t care for fantasy type stories until I read one by a favorite author who usually wrote in another genre. After reading The Fire Trilogy I’m beginning to believe that if an author writes well in one genre he/she can probably write just as well in others. The Fire Trilogy is the first non-shifter fantasy book I’ve read by RJ Scott and, like nearly everything else I’ve read by her, I loved it! I think because I’m not really used to reading this A fantastic fantasy story! I used to think that I didn’t care for fantasy type stories until I read one by a favorite author who usually wrote in another genre. After reading The Fire Trilogy I’m beginning to believe that if an author writes well in one genre he/she can probably write just as well in others. The Fire Trilogy is the first non-shifter fantasy book I’ve read by RJ Scott and, like nearly everything else I’ve read by her, I loved it! I think because I’m not really used to reading this genre, it took me a little bit of time to get into the story but once I got there I was hooked and couldn’t put this down. 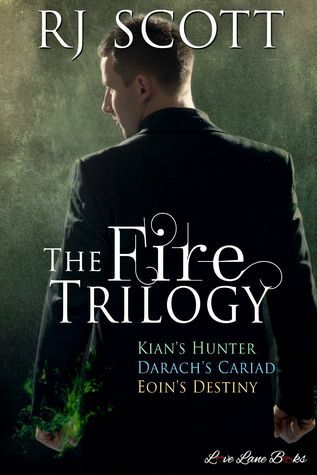 This set includes Kian’s Hunter, Darach’s Cariad and Eoin’s Destiny. I’m so glad that RJ Scott released these as a set because the stories must be read in order to fully understand what is going on. You can also save quite a bit by purchasing this set instead of the individual books. Each separate book took me deeper and deeper into the overall story. Ms. Scott’s writing painted a rich description of a parallel world that I wouldn’t mind visiting. The story has a more than satisfying conclusion but I wouldn’t mind reading a follow-up to let us know how things are going a few years down the road.